Social media image sizes fluctuate constantly as improvements to social networks are made by developers. Part of our jobs as marketers and influencers is to ensure that we stay up-to-date on the recommended image sizes we should be uploading to the network we use. Why does it matter if our images are a little off? Should we really spend so much time on perfecting the image sizes on our favorite social media networks? The first impression our followers have of the brand we represent is often made by visuals. Attention-grabbing, visually appealing images sets the tone of what our brand is, and what kind of audience we’re reaching. Uploading the wrong image size can result in your image being distorted, or cropped in ways that turn away your audience. Trying to capture your audiences’ attention in 0.25 seconds is hard enough, you don’t want to mess it up with something easily fixed. There’s many cheat sheets out there that promise to keep you up-to-date on the latest social media image sizes but having their website up every time you need to check the dimensions is just plain annoying. We love time saving hacks just as much as the next person, so trust us when we say that printing this cheat sheet will save you the headache of looking up the dimensions, or uploading something that doesn’t look stunning. 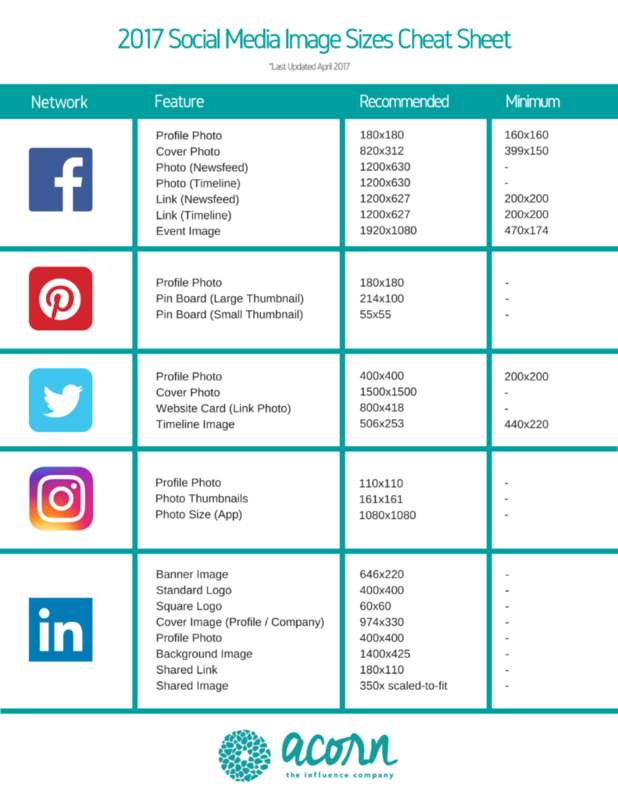 So, here we present to you the Acorn Influence 2017 Social Media Image Sizes Cheat Sheet. Below the infographic you will find the link to the downloadable PDF. Print it and pin it up next to your desk, or favorite working space for easy access.